The Geolocation API is a very simple API that allows to get a device’s current location coordinates. It has only two methods: getCurrentPosition and watchPosition and the data returned is very straightforward, but when coupled with a mapping API, complex location-aware web apps can be created. // 🗺️ yep, we can proceed! Use the getCurrentPosition method to get the user’s coordinates once. The first and only required argument should be a success callback function that will be called with a position object if the position request is successful. As you can see from the above example, some of the properties for coords may have a value of null. The availability of the data will depend on the capabilities of the device that’s under use. The heading value, if any, will be in degrees relating to true North and going clockwise and the speed value, if any, will be in meters per second. If the user refuses access, the error callback, if any, will be called with an error code of 1 (PERMISSION_DENIED). There’s also a watchPosition method that will return new position data each time the device changes position significantly. We use clearWatch with a watcher id to stop watching for position data. You can provide an error handler callback as the second argument to either getCurrentPosition or watchPosition. If the error callback is called, an error object will be passed-in and will contain a code property that will have a value of 3 (TIMEOUT), 2 (POSITION_UNAVAILABLE) or 1 (PERMISSION_DENIED), depending on the nature of the error. enableHighAccuracy: Takes a boolean value and defaults to false. Indicates if the position information should be as accurate as possible (more accuracy may be more costly in terms of CPU and battery usage). maximumAge: Number of milliseconds to keep position data cached for. It defaults to a value of 0.
timeout: Number of milliseconds after which the error callback will be called if no data has been acquired. If there’s cached position data that’s available and that’s a maximum of 25 minutes old (1500000ms) we return that. If not, we error-out immediately (using a timeout of 0ms). In the error handler case for a timeout, we provide a default location value and then make another call to get fresh location data. This way, the app can avoid showing a blank state while fresh position data is being gathered. 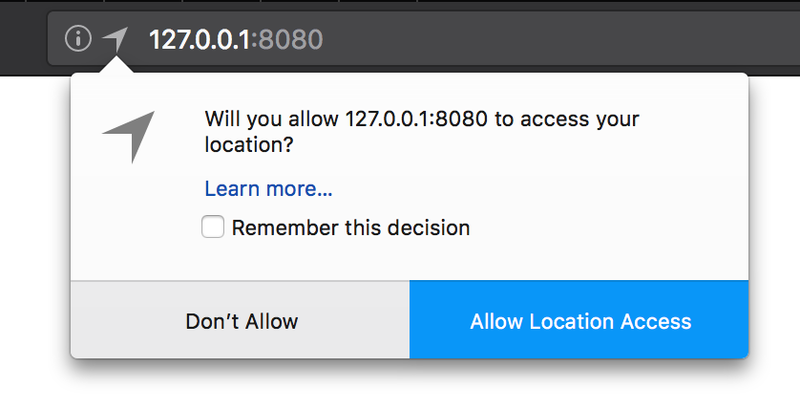 Can I Use geolocation? Data on support for the geolocation feature across the major browsers from caniuse.com.